Properties in Carterton average 4.6 out of 5 stars. 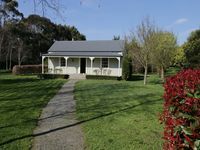 Property 28: Watsons Cottage Rural 4 Kms from town centre. Property 30: A-frame 5 minutes from the centre of Greytown - Country Village Heaven. Property 33: Get away from it all! Property 36: Luxurious lodge in bush/riverside setting. Property 37: Ever wanted to stay in a beautiful Character Home? 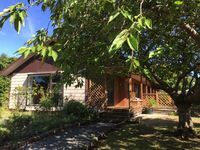 Property 41: Chris's Cabin | Private Garden, Large Deck | Sleeps 7. Property 49: Green Barn accommodation on a working farm in the heart of Gladstone. This charming Wairarapa cottage is just heaven. It is so perfect. The location is so peaceful, it is so beautifully enveloped by such lovely trees you feel when you first arrive that you have discovered a rural oasis. The property is charming and beautifully finished. Ample space and all modern conveniences. The heart of the property is the living room with the wood burner - this place cries out for relaxing reading by the fire. The kitchen is perfectly stocked with all the tools and crockery and glassware you could ver wish for. The bedrooms and furnishings are top quality as goes for the bathroom. The heritage, the period details and other all ambiance make this a 10 star property.